These Welsh rockers were one of the stars of the Underground Rockers 2 compilation and after seeing them live a few times and interview seemed a must. I don't want to put a weight around their necks but they remind me a lot of The Clash, they're not copyists though and just 'cause they sing in English, unlike Anhrefn and don't play at 100 M.P.H. like the Abs doesn't mean they're not superior to these bands. Thanks to preacher Richey for some interesting answers. BTN: How did you get your name? Richey: "We locked ourselves in our room, beat each other up, rejected everything around us and decided on the name Manic Street Preachers." BTN: How did you get involved with Damaged Goods? Richey: Ian saw us an snatched us from obscurity. We are recording four songs for his label. they are "New Art Riot", "Teenage Twenty-Twenty", "Faceless Sense Of Void", and "UK Channel Boredom". Hopefully is should sound like the deadness in our hearts, like the frustration of being a nobody, useless, a number in the city. A suicide beat. A Hastenoise. BTN: Do you find it difficult to get gigs? Richey: "Yeah. but, mainly but mainly because no one wants to play with us, especially in London and here in Wales. We are pretty hateful, young , exiles and pretentious. Wales does not count, it is full of people who accept a life of nothing, especially as they seem to thrive on the state fed lies of nationalism. BTN: There seems to be a big Clash influence in your music. 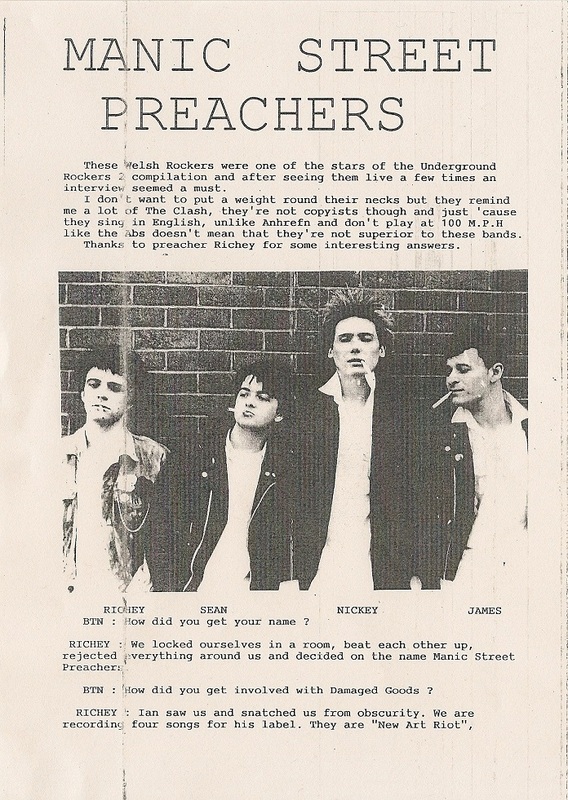 Richey: In that we are not prepared to be a part of the obedient multitudes we were influenced by the 1st Clash album. But we exist and live now. There is nothing in the past that we want to belong to and the current death camp we live in is just as killing. We spray paint our school uniforms to wipe out the murder of five years at school, we are young and don't like ourselves at all. We are trying to wash away the misery enforced upon us. Right now we have no heroes, all we have is desolation." BTN: What other bands do you rate old or new? Richey: Any bands that have politics and that includes the improvised nihilism of Birdland. 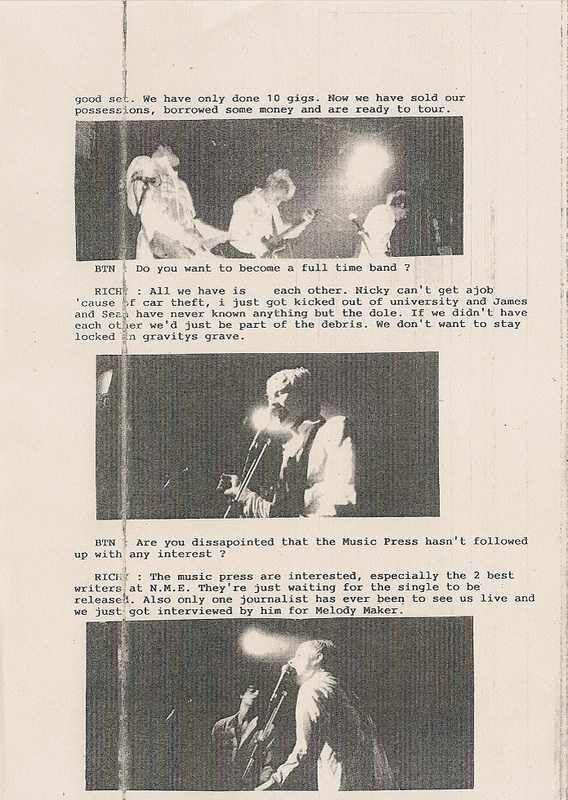 BTN: Did you get much response from "Suicide Alley", after all it was an NME single of the week? 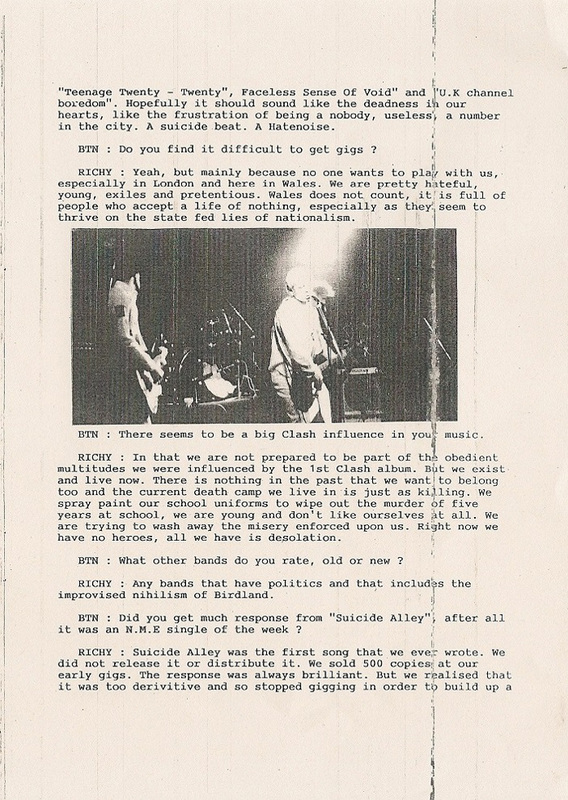 Richey: Suicide Alley was the first song that we ever wrote. We did not release it or distribute it. We sold 500 copies at our early gigs. The response was always brilliant. But we realised that it was too derivative and so stopped gigging in order to build up a good set. We have only done 10 gigs. Now we have sold our possessions, borrowed some money and are ready to tour. BTN: Do you want to become a full time band? Richey: "All we have is each other. Nicky can't get a job 'cause of car theft, I just got kicked out of university and James and Sean have never known anything but the dole. If we didn't have each other we'd just be part of the debris. We don't want to stay locked in gravity's grave. BTN: Are you disappointed that the music press hasn't followed up with any interest? Richey: "The music press are interested, especially the 2 best writers at NME. They're just waiting for the single to be released. Also one journalist has ever been to see us live and we just got interviewed by him for Melody Maker. This page was last modified on 22 March 2018, at 18:28.